The Mayan calendar says the world is toast come 2012. In case they're right, we created our hardest workout ever to get you ripped by doomsday. If you've paid any attention to tabloid headlines or the ancient Mayan calendar, you've probably heard that the world will end in 2012. If we assume it's true, wouldn't you like to go out in the best shape of your life? We've created a workout so tough we bet you've never experienced anything like it before, or will again. Survive the Armageddon battleground and you'll face the unknown with a ripped physique, killer conditioning, and the knowledge that there's nothing in the future you can't handle. The deadlift is a total-body strength exercise and can also be used to build endurance and burn massive amounts of calories. You'll begin the routine with drop sets on the deadlift, going from a heavy load down to a light one with no rest in between. Then you'll alternate sets of two more exercise pairs. On the first pair, shoot for 100 total reps, and on the second, pump out as many reps as you can in a minute's time. The goal is to push yourself as hard as possible, activate all your muscles, and build your wind. The workout is an enormous challenge for your body and mind, but if you find yourself burning out in the middle of it, remember-it's not the end of the world. Perform the routine once per week, allowing two days' rest before any other lifting. » TIME NEEDED: 30 min. Perform the exercise pairs (marked "a" and "b") as alternating sets. Do one set of "a", rest as prescribed, then one set of "b", and repeat until all sets are complete. Stand with feet hip-width apart and toes turned out slightly. Bend down and grab the bar with your hands just outside your knees. Keeping your lower back arched, drive your heels into the floor. Pull the bar up along your shins until you're standing with hips fully extended and the bar in front of your thighs. If you're an experienced deadlifter, load the bar with about 90% of your estimated max. Start by placing a 45-pound plate on each side (135 pounds total if you're using an Olympic barbell). Now load the bar so that you have four plates of whatever weight works for you on each side of your original 45s. For example, if 90% of your max comes out to 325 pounds, you would load the bar with a 35 plate, two 25s, and a 10 on each side (either end of the bar would look like this: 45 plate, 35, 25, 25, 10). Perform one rep and then slide one plate off each side of the bar. Immediately perform five reps. Pull off the next set of plates and do another five reps. Continue performing five reps at a time until only the 45s remain, then do as many reps as you can with them. Do not rest any longer than it takes to remove weight from the bar. If you have never deadlifted before or are still new to it, load the bar with 45s and then load four 10-pound plates on each side. If you're using an Olympic barbell, this will be a total of 215 pounds. Perform one rep, then slide one set of 10s off. Now perform five reps. Take off the next set, and do another five reps. Continue, performing five reps at a time until you're down to the 45s. Then do as many reps with them as you can. Perform 20 push-ups (rest on your knees later during the set if needed). Then move on immediately to the bentover lateral raise. Alternate exercises until all sets are completed. push-up for building the upper body. Hold a dumbbell in each hand and bend forward at the hips until your torso is almost parallel to the floor. 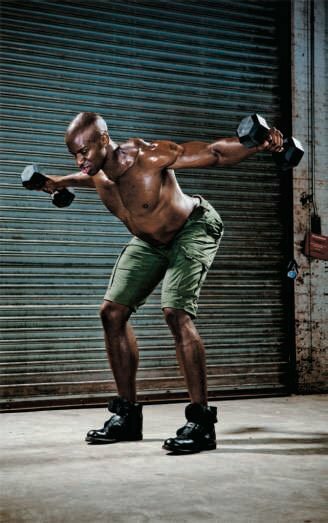 Squeeze your shoulder blades together and raise the weights out 90 degrees. As you fatigue, you can use rest-pauses-perform as many reps as you can, then pause at the bottom of the movement, and breathe as needed. Continue until you hit all 20 reps. Afterward, go right back to the push-ups. focusing on his rear delts, like he should. Get in front of a clock with a second hand or use a timer. Hold a chin-up bar with a shoulder-width grip and palms facing you. When the second hand passes the 12, do as many chin-ups as possible. Then go right to the lunge jump and do reps until the second hand reaches 12 again (one minute has elapsed). Rest one minute. Get into lunge position with your rear knee nearly touching the floor. Jump as high as you can and switch your legs in midair. Land with the opposite leg forward and immediately begin the next jump. Requires 5 plates per side. Remove one plate per set. Superset: Begin counter at beginning of set. Each set lasts one minute.